As we settle into fall, I find myself craving my paleo pumpkin pie smoothie. It’s like a pumpkin spice latte, without the caffeine jitters and dairy intolerance issues. I made this smoothie for some friends on my tennis team last year and it was a winner! This liquid nutrition was actually part of an assignment I did for the Academy of Culinary Nutrition. I focused on an autoimmune condition and developed recipes specifically targeted towards nourishing these clients. A key focus for clients with autoimmune disease is to support the immune system, increase anti-inflammatory foods, and improve metabolic function. This smoothie offers a range of nutrients to aid in healing and help increase energy levels. Vitamin A helps vision, immune, and inflammatory systems. My paleo pumpkin pie smoothie is a also great way to start your morning, or recharge after a workout. What’s even better is that this smoothie is also kid-approved in my house. Those bananas make it sweet, so feel free to decrease to your taste. To make homemade pumpkin puree, slice the top off of a pie pumpkin and then cut the pumpkin in half through the middle. Remove the seeds and then cover the pumpkin pieces with some coconut oil and roast for 30 minutes cut side down on a baking sheet in an oven at 400 degrees. Scoop out the insides and reserve pumpkin for smoothies or soup. If you use store bought pumpkin puree, look for the organic version sold in cardboard boxes instead of cans. (See this option here.) The reason to skip the metal can (even BPA free) is to reduce your exposure to metal, which is an issue for women dealing with autoimmune sensitivities. If you are curious about other foods or chemicals to avoid, you can sign up for a free consultation here. GRAB MY FREE SMOOTHIE EBOOK WITH LOADS MORE SMOOTHIE RECIPES! This smoothie is like a guilt-free slice of pumpkin pie! My paleo pumpkin pie smoothie is both dairy free and gluten free. In a high speed blender, add all ingredients in the order listed. Add a large handful of ice cubes if you prefer an even thicker smoothie. Blend on high till thoroughly combined. Enjoy. You can find my recipe to make homemade almond milk here, homemade vanilla extract here, and my favorite place to get the pumpkin pie spice is Trader Joe’s. I hope you enjoy your paleo pumpkin pie smoothie this fall. It’s a great way to nourish you body, and get that pumpkin fix covered. By Roasting Them for a Relatively Short Time at a Low Temperature You Can Help Minimize Damage to Their Healthy Oils. Linoleic Acid (the Polyunsaturated Omega-6 Fatty Acid) and Oleic Acid (the Same Monounsaturated Fatty Acid That Is Plentiful in Olive Oil. “Squash, Winter.” Squash, Winter. World’s Healthiest Foods, n.d. Web. 01 Nov. 2016. Ware, Megan, RDN LD. Medical News Today. MediLexicon International, n.d. Web. 01 Nov. 2016. “Vitamin B6 – Pyridoxine.” Vitamin B6 – Pyridoxine. World’s Healthiest Foods, n.d. Web. 01 Nov. 2016. Every year I like to find a delicious summer recipe I can make over and over as new guests arrive at the beach. I learn how to make it without recipe cards or books. This keeps things simple in the kitchen during the summer months. After a day at the beach, I want quick recipes, food for a crowd, and lots of fresh vegetables. Here’s a list we can use to plan out our summer meal plans and spend more time playing out side. For more inspiration, check out the years of past dinner plans here, my Pinterest collection here, or OrgJunkie for a link-up of weekly meal plans. I hope you find a new delicious summer recipe to feed your family this summer! Snacks are a big deal in our house. After a year of making them, these Lemon Cashew Coconut energy balls are definitely at the top of the list. They a full of real food ingredients, easy to customize, and quick to make. Both the kids and the adults love these as a quick trick, and they even fulfill those sweet craving we all struggle with. I’ve seen energy balls sold at the stores lately for $5/bag that may include just a couple balls. What? I’m telling you, it’s so easy to make these yourself if you have a food processor. Gather your ingredients together, pit and soak your dates, and get ready to blend away. I’ll make these in the afternoon before the kids come home from school and they love them. These are not nut-free so this is always an at home snack for the kids. These lemon cashew coconut energy balls are also a great replacement for the energy bars at the store. So many of them market themselves as healthy, but take the time to read the label. If it starts with “brown rice syrup” or “agave” then you are giving yourself a sugar shock. Yes, these dates are super sweet in the recipe below. However, they offer some nutritional benefits whereas those other “sugars” do not. Don’t make the mistake of being fooled into buying adult candy bars in the health food energy bar aisle. Great question. Dates tend to be high on the glycemic index, making it a “high carb” fruit. However, I think it’s a great snack, or treat, as it has a very high percentage of fat and protein paired with them. What I love about this recipe is it pairs fat + fiber + protein, helping your hormones stay balanced and keeping you full longer. Enjoy this recipe collection to get your started on the ketogenic diet. Here’s a few things why I love this recipe. Cashews are a great protein and fat source that helps keep your blood sugar stable. Plus they even act as an antidepressant!. Lemons offer a dose of vitamin C and it’s antiviral, antibacterial properties. Coconut contains a healthy fat needed for brain health. I make this with either lemon zest, or a couple drops of lemon essential oil. Use whichever you have on hand, or whichever you have time for! If you want your lemon cashew coconut energy balls to really stand out in the mix, you can add the dough to a large bowl and then stir in the coconut flakes. However, in the interest of time, and clean up, I’ve thrown it all into the food processor in stages and it comes out delicious. An easy, healthy energy ball snack recipe that everyone will excited for! This recipe was inspired by Nutrition Stripped. Place the pitted dates in a small bowl with hot water. Let soak for 5 minutes while you gather ingredients. In a food processor, grind the cashews first until you have small bites. Stop before you create cashew butter! Add the balance of ingredients, except for the shredded coconut. Blend well. Add the coconut and pulse a few time until well combined. Make golf ball size balls and place on a plate. Transfer plate to the refrigerator to chill for 20 minutes before serving. Here’s a bonus for you. Roll them in white or black chia seeds for an extra boost! Chia seeds help provide digestive support, which is critical for anyone dealing with autoimmune issues. I mentioned them in my Autoimmune Meal Plan and they help provide both Omega 3’s and support for easy elimination. Let me know how you enjoy these Lemon Cashew Coconut Energy Balls! Enjoy. NEED MEAL PLANNING IDEAS FOR FAMILIES? MY HEALTHY MEAL PLAN BOOK IS HERE! Meal planning ideas for families are not easy to come by – even for the best recipe site searchers and Pinterest fans. The number #1 complaint I hear from readers, and clients, is their challenge with meal planning. They know it’s an important part of achieving their health goals, and also a way to limit their stress at dinner. But they get stuck when it comes to sorting through recipes. There are recipes coming at you online, in magazines, cookbooks, Pinterest, friends, and so on. What if someone could create a healthy meal plan for you? When my daughter was in daycare, I remember the struggle of rushing to pick her up. How fast can I get her, get home, and get dinner on the table. Those stressful nights became manageable once I started meal planning. I’ve been crafting meal plans here on the blog for nearly five years. Each week I’ve shared my posts and I started to see some trends. There were recipes we kept coming back to because they were family-friendly, easy to prepare, and use real food ingredients. The 4-week healthy meal plan guide was born. I heard from you the need to simplify. You want healthy recipes, but you don’t want to spend hours trying to find them. This book includes my favorite recipes that I go back to time and time again. These are the recipes that live in my meal planning binder and are stained from pulling them out so often. 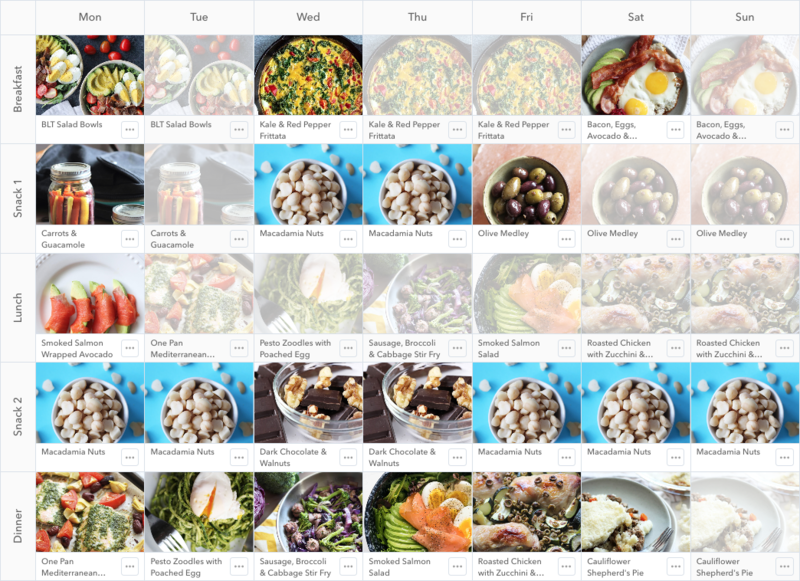 I went another step an organized all of these recipes into meal plans for you. You can see the recipes are easy to follow, and only use real-food ingredients. I’ve also included substitutions for making meals gluten-free or dairy-free if needed. Plus, there are side dishes suggestions to pair with the main meal. Often times I see meal plans and they include one main dish, or casserole. If you have kids like mine, I often need to cook meals that I can deconstruct. (or just not have anything touching each other!) Deconstructing a meal is a great way to make one thing for everyone and expose kids to a wide range of flavor and color.Keep some veggies raw that they may eat and cook for the rest of the family. Kids may not always eat everything, but overtime you will be surprised when one day they suddenly eat asparagus after swearing it off years ago. The 24 recipes included are ones that I use for some of my custom meal planning clients. I want everyone to feel more confident in the kitchen and these are simple to follow. These recipes arm you with a plan for the end of the day when you are exhausted. You want to call for takeout because you didn’t plan anything for dinner. Get ahead of the game and use these healthy meal plans instead. The more you eat at home, the more your energy will increase, your sleep can improve, and you are saving money. Know what you are eating and avoid exposing yourself to processed foods and chemical preservatives. It’s the best way to optimize your health. You should know that the recipes suggestions you gave us are still among our favorites! Ready to grab your copy? The price is $17 and will save you time and money each week. Use any leftovers for lunch the next day and save yourself time and money by skipping lunch from the local shops. Your healthy meal plan can be printed out and bound at your local Staples. Did you know you can even print to them directly?! Ask for it to be spiral bound so it can lay flat on your kitchen counter. Let me know how you are using these meal planning ideas for families, and join us in the Facebook group here to share which ones are your new favorite recipes. Enjoy. https://emilyroachwellness.com/wp-content/uploads/2018/12/rainbow-thai-salad-healthy-meal-plan-recipe-e1490899756143.jpg 2666 2000 eroachwellness https://emilyroachwellness.com/wp-content/uploads/2018/11/Emily-Logo-header-1.png eroachwellness2017-03-30 18:28:062019-04-12 08:11:44NEED MEAL PLANNING IDEAS FOR FAMILIES? MY HEALTHY MEAL PLAN BOOK IS HERE! HOW TO MAKE ALMOND MILK- IT’S EASIER THAN YOU THINK! I have taught my eight year old daughter how to make almond milk so I think it’s time I teach all of you. It’s a lot easier than you think. With just two ingredients, almonds and water, you can create fresh almond milk. No added preservatives, “gums” or questionable ingredients. Just straight up homemade almond milk. It’s a normal part of our routine in the kitchen and we make it usually 3-4 times per week. Almond milk can be used as milk in your baking recipes, your morning coffee or tea, or in some homemade granola. I love to use it for making elixirs, like turmeric lattes, or homemade hot cocoa for the kids. Do my children drink almond milk at dinner? No, instead we look for grass-fed, organic full fat milk. I offer it sparingly as dairy for children can often be the root cause of their ongoing bouts of the sniffles. Raw, unpasteurized grass fed milk is the very best, but very difficult to obtain. It’s still illegal in some states, but I see this beginning to change. To look for raw milk in your area, check out the Real Milk site. A quick note about soaking your almonds. Soak the almonds in clean water for at least 6 hours to remove phytic acid. Often I will soak them overnight and process in the morning. You can see in the picture below what the water will look like after soaking is complete. Rinse away the phytic acid that has been drawn out. The acid is what makes nuts hard to digest. Now you have washed it away and are left with the good parts of the almond. TWO KEY TOOLS YOU NEED TO MAKE ALMOND MILK. I find the smaller size nut milk bag much easier to manage. This is one I recommend off Amazon, but you can also find them at Whole Foods or your local health food store. For blenders, the high speed ones include the Vitamix, or the Blendtec which I use. (I’ve have a refurbished one it’s going on 4 years.) I can’t speak to other blenders, like KitchenAid’s new one, but if you have it and it works for you, let me know! If only these blenders were quieter I would be delighted. Phytic acid is considered an “anti-nutrient,” making it harder for your body to absorb vitamins and minerals available from food. Measure 1 cup of raw almonds and place in a medium bowl. Cover with filtered water until the almonds submerged, and covered by an additional 3″ of water. Let this bowl sit on your countertop for 6 hours, or overnight. Using a fine mesh strainer, drain and rinse your almonds. Dispose of the old water. In a high speed blender, measure 4 cups filtered water. Add almonds and blend on high for 1 minute. Holding a nut milk bag over a large bowl, pour the almond milk mixture into the bag. Squeeze all the milk you can out of the nut bag. Transfer almond milk to glass containers and store in the refrigerator. It will last at least one week. (although mine is gone before then!) These caps are awesome for pouring almond milk. Toss the almond pulp, or store in glass container to use later. You can use the almond pulp for almond coconut macaroon cookies or almond pulp truffles. Here’s a great round up from my CNE program here of how to use leftover almond pulp. A fellow CNE grad Jessica Grosman also created this Chocolate Mousse recipe with leftover pulp. Let me know if you try to make your own almond milk. Don’t let this happen to you…our kids all love having a turn squeezing the milk out. Turns out it’s best to just let one kid at a time be a helper. We ended up with milk and almond pulp everyone after this picture was taken for my homework assignment this fall. What a mess! After restraining it all was not lost. Let me know if you have any hiccups with making your own almond milk. I may have already gone through it before! I actually learned how to make almond milk when I first looked into The Academy of Culinary Nutrition. When I saw the teacher make the milk in a video and I realized how easy it is. I promise you this is one of the easiest recipes you can master and test out in your kitchen. https://emilyroachwellness.com/wp-content/uploads/2018/12/my-homemade-almond-milk.jpg 2224 2000 eroachwellness https://emilyroachwellness.com/wp-content/uploads/2018/11/Emily-Logo-header-1.png eroachwellness2017-03-16 18:29:272018-12-15 18:53:41HOW TO MAKE ALMOND MILK- IT’S EASIER THAN YOU THINK! The quest for a delicious healthy granola bar has been a long one. Usually it needs to be a nut-free granola bar safe for school, and it has to pass the kid taste test. Plus it has to be refined sugar free, use real food ingredients, and give adults the protein we need in a snack. A long time ago I shared this recipe for a homemade granola bar, now I’ve updated my standards and sharing with you my latest healthy granola bar recipe. The new recipe guide is dairy free, gluten-free, (nut-free if needed,) and full of flavor. Old fashioned, or large flakes, oats are still the base of my granola bar. They are fairly inexpensive and adding them helps to stretch your dollars. However, I do recommend the gluten-free organic oats when you can find them. Oats are a heavily sprayed crop with pesticides so it’s in your best interest to opt for organic when possible. You won’t find any refined sugar in this granola bar, or sugar hiding as brown rice syrup or tapioca syrup and so on. The two sweeteners I’m using here are Medjool dates and a little bit of molasses. The dates provide fiber, plus vitamins B6, potassium, magnesium, copper, and manganese. The molasses contains manganese, copper, iron, calcium, potassium, magnesium, vitamin B6, and selenium. Always opt for blackstrap molasses and not the imitation stuff. It’s also rich in antioxidants, which we need to help rid ourselves of toxins that can build up in our body from the environment. Regular sugar doesn’t have any of that good stuff, and instead can aggravate anyone with inflammatory conditions like headaches, joint pain, skin issues, and autoimmune conditions. Generally everyone I know suffers from something on this list. Swapping out our sweeteners to use unrefined sugars 9 out 10 times has really helped our family’s health this year. (I haven’t mastered sugar cookies without sugar, but let me know if you do!) The less sugar you have in your diet to begin with, the less you crave it. Take a look at the granola bars from the stores and you will often find sugar as the first ingredient. It may be hiding under a different name, but it’s still there. I’m not just talking about kid granola bars either, those energy bars everywhere are like candy bars for grown ups. Always read your label and you may be surprised that a real food isn’t the first ingredient. Did you know sesame seeds add a dose of calcium to these granola bars? My healthy granola bar recipe is easy to update to a nut-free version. You can make them safe those with nut allergies by using sunflower butter instead of almond butter. I baked them once with both sunflower butter, and sunflower seeds, and it was just too much sunflower! The recipe is easy to adapt to your personal likes/kids’ dislikes and it will still come together. You will need to bake them for a short time, and let it cool thoroughly, which helps it retain its shape. No one wants a crumbly granola bar! You will get a dairy-free, refined sugar-free recipe for healthy granola bars that everyone will love. Swap in your favorite dried fruits, superfoods, and even protein powder for an added boost of energy. Preheat oven to 350F. Line a 9x11 baking pan with parchment paper. In a large bowl, combine the oats, dates, dried fruit, pumpkin seeds, sesame seeds, cinnamon, and salt. Over low heat, add the almond butter, honey, coconut oil, and molasses to a small saucepan. Gently warm and stir until thoroughly combined. Transfer the granola mixture to the baking pan and press down evenly using your hands or a spatula. Bake for 18-20 minutes, or until lightly golden. Remove from heat and let cool for at least 30 minutes. Cut into desired size and store in an airtight container. Have fun making your own healthy granola bars. Let me know how they turn out! Everyone needs quick and easy dinner recipes, and those that work in the slow cooker are even better. This easy curry chicken slow cooker stew is a favorite in our house, even with the kids! I had to share it with you for those days when you need an easy one-pot-meal to be ready when you walk in the door. Swap carrots for the sweet potatoes, or add both! An easy chicken curry is a great base for adding in extra root vegetables. Carrots, turnips or celeriac root are all good vegetables you can add to this meal to increase the plant ratio. My favorites are sweet potatoes and carrots as they work well for the young palettes in our house. Curry is a healing spice and if you can make your own homemade batch to keep on hand, even better. Curry includes the all important turmeric, which is both an anti-cancer, anti-depressant, and an anti-inflammatory root. Turmeric also helps aid digestion, which can be helpful if anyone has had issues with lentils (or chickpeas) in the past. It’s a detoxifying spice and we can all use that on a regular basis. Gather all your spices in a large bowl, then transfer to a lined baking sheet. Gently roast at 250°F for about 20 minutes, or until fragrant. Watch the spices to avoid burning them! Let the spices cool off before grinding them. I use a spice grinder like this one. Grind in small batches, then transfer to a glass storage jar and store in a dry, cool place. Using homemade curry powder in the Slow Cooker Curry Chicken Stew just takes it up a notch. No time for homemade curry powder? Grab one from your favorite store (or this organic curry from Amazon) that does not include irradiated spices. A note about slow cookers. If you are shopping for a new one, here are the features I think are most important. First, it needs to be digital. Next, it needs to be flexible so you can can adjust the cook times. Having the slow cooker switch to “warm” when complete is very helpful. I love that feature when I make overnight oats. Lastly, look for a model with a ceramic or stainless steel insert. Avoid any that use non-stick surfaces. My favorite slow cooker to recommend is the Bella Slow Cooker, as it allows you to also sear meats over the stove top too in addition to the other functions I mentioned. An easy weeknight meal in the slow cooker, Curry Chicken Stew is a one-pot-meal with loads of vegetables and flavors. In a large slow cooker, add the sweet potato, lentils, corn, peas, spices, garlic, and broth. Stir to combine. Lay the chicken breast on top of the mixture and set to low for 6-8 hours, or on high for 4 hours. Remove from heat and shred the chicken breast. Add back to the mixture and gently stir to combine. Enjoy as is, or serve over quinoa or brown rice. Make it vegan and skip the chicken and use vegan broth. (see link below) Add additional root vegetables like carrots, turnips or celeriac root to the stew. I hope you enjoy this easy curry chicken slow cooker stew. Let me know what you think! It’s been nearly one year since I started drinking bone broth every morning. Today I’m telling you why I started making my own homemade bone broth in the slow cooker, and the benefits of a daily dose. It’s a question that comes up often in conversation so I thought it was time to walk you through why I added this to my morning routine. In article after article, bone broth is being treated as the next new thing. The funny part is that it’s not new at all. Bone broth has been around nearly as long as fire. Our ancestors were so much better at using all of an animal when they hunted for food, all the way down to the bones. Bones were used as tools, and later simmered to create nourishing broths. These broths were used to treat digestive upset, and today they do the very same thing. Last year was a tough time for our family. We moved to a new country away from all our friends and family. We had a. lot. more time on our hands, and I found myself spending it in the kitchen. Although I was lonely in a new place, I found joy in the kitchen. I dove head first into reading more nutrition books, instead of my usual slew of cookbooks. (I get new cookbooks out of the library weekly!) I registered for The Academy of Culinary Nutrition and started to make some changes to our eating habits. Making our own bone broth was a big part of the change. It was the book, The Stash Plan, that first explained to me why bone broth was so nourishing. When we drink a rich, bone broth first thing in the morning, our body is best able to absorb all of the minerals available to us. It’s also the perfect opportunity for healing to take place in the digestive tract. Our bodies are constantly in need of detoxifying, it’s not a yearly thing like many people believe. It’s a daily thing. Bone broth helps eliminate the waste products that builds up in the gallbladder and liver. Bone broth gives us the amino acid glycine, which helps with the production of glutathione, and helps to detox the liver. Those popular juice cleanses are missing the element of fat that is necessary for toxins to glob onto to exit the body. A homemade bone broth provides the structure needed to clear the pipes. After a year of drinking bone broth, I feel ready to share my knowledge with you. I think it has been crucial for helping me fit strong enough to play tennis four times a week, and still have energy for the rest of the day. I drink both beef bone broth and chicken bone broth and rotate between the two. I use a slow cooker method and keep letting it cook for at least 24 hours, and then until I have 15 minutes to strain and store it. I took a break over the summer for a couple of weeks, but used a Collagen supplement in my smoothies instead. I recommend either Great Lakes or Vital Proteins brands. It was drinking bone broth that also helped me give up my coffee addiction…but that’s another long post. WHY SHOULD WE DRINK BONE BROTH? Bone broth is one of the best healing foods for the gut. New science is teaching us about the unique microbiome of bacteria that lives in, and on, each of us. There’s a new focus on keeping your gut microflora healthy and resilient, and bone broth is one of the best ways to do this. Provides a wide variety of rich minerals and amino acids, including calcium, iron, magnesium, potassium, zinc, and selenium. WHAT MAKES BONE BROTH SO MEDICINAL? Both gelatin and collagen are present in bone broth. These proteins help reverse damage in your digestive tract. Our digestive tract gets damaged by using antibiotics, aspirin, Nsaids, refined sugar, flour, caffeine, alcohol, and fried food. Bone broth can also help heal leaky-gut syndrome, which affects many women with autoimmune conditions and children with Autism. Collagen provides us with glycine, lysine, and proline. These are the amino acids that help keep our skin looking younger. Did you know the collagen in topical skin products really won’t get absorbed because the molecular structure is too large to penetrate the skin? You have to work from the inside out. WHAT ARE WE TRYING TO AVOID IN STORE BOUGHT BROTH/STOCKS? Many of us know we need to avoid MSG, or Monosodium Glutamate. MSG creates free glutamic acid in our body, which quickly becomes a neurotoxin. Many people often get a headache or nausea after ingesting MSG, however, there are worse side affects now documented. MSG is an excitotoxin, and it pushes our metabolism into an insulin- or adrenaline-dependent mode, which makes us store more fat. MSG is often found in processed foods or fast-food, but also in store bought stocks. WHY IS BONE BROTH CRUCIAL FOR CONCUSSION PATIENTS? Bone broth helps reduce inflammation, including that in the brain, and it’s a lot harder to heal the brain if the gut is unhealthy. There’s new studies that show brain inflammation is linked to ADHD, depression, and dementia. People who switch to a diet that includes bone broth report an improvement in both mood and memory. SHOULD I DRINK BEEF OR CHICKEN BONE BROTH? The main difference between beef bone broth and chicken bone broth is flavor. Beef broth is better for richer stews, or for combining with roasted vegetables. Chicken broth is more mild and great for vegetable purees. CAN I MAKE A VEGAN BROTH? Yes, a vegan medicinal broth is possible, although it will be missing the amino acids from collagen and gelatin. If you want to upgrade your traditional vegetable broth, add seaweed. Seaweed enriches the broth with a wide variety of nutrients as well, which supports thyroid health. Get my recipe for vegan broth here. CAN I BUY BONE BROTH FROM A STORE? HOW DO I MAKE BONE BROTH? There is a variety of opinion when it comes to how to make bone broth. The key factor is to make sure you have the right ratio of water to bones to make sure you get that beautiful, gelatinous consistency at the end. If you use too much water, it will cause the broth to be diluted. Also, low quality bones will also alter the broth consistency. Conventional factory farmed animal bones don’t produce as much gelatin as pasture-raised animals. HOW LONG DOES IT TAKE TO MAKE BONE BROTH? WHAT TEMPERATURE SHOULD I COOK THE BONE BROTH? After the water is brought to a boil, reduce the heat to the lowest setting. If the heat is too high, it will destroy the collagen. CAN I MAKE BONE BROTH IN MY INSTAPOT? Yes, you can. However, it often doesn’t gel in the same way as traditional bone broth methods. The best way to make it is by following my recipes, but use the Soup setting on Low for 120 minutes (or longer if you have the newest versions.) Let it release the pressure naturally so you still need at least 3 hours to complete the broth. If you want to make sure you get the good gel at the end, add some chicken feet to your chicken bone broth! I have not purchased an Instapot yet, as I already have an electric pressure cooker that I love and does the same thing. DO I NEED TO USE APPLE CIDER VINEGAR IN MY BONE BROTH? After researching this question, my conclusion is to include either apple cider vinegar (ACV), or wine, in your broth. The acidic nature of the vinegar, or wine, helps to draw out more of the minerals from the bones. What is not suggested is to use ACV in your broth and let it sit before cooking it. In the interest of food safety, include the ACV along with your water when covering the bones to cook. WHAT CAN I DO WITH MY BONE BROTH IF I DON’T WANT TO DRINK IT STRAIGHT? Not everyone is keen on a mug of bone broth, but that doesn’t mean you can’t enjoy the benefits of including it in your daily routine. You can make your rice or quinoa using bone broth, use it as a base for soups, or warm it up and serve over some greens for a warm winter meal. I really enjoy the recipes for various bone broths in the Broth and Stock from the Nourished Kitchen cookbook. A homemade bone broth provides so much nourishment for your body. It helps heal the digestive tract, improve immunity, fights wrinkles, and reduces inflammation. Place bones on a roasting pan in a single layer. Roast for 45 minutes. Transfer bones to a heavy stock pot, or slow cooker. Add the onions, carrots, celery, garlic, ginger, peppercorns, bay leaves, and thyme. Cover everything with water and wine. Bring the liquid to a boil. Skim off any foam or impurities that rise to the top. Turn heat down to the lowest setting while maintaining a simmer for at least 12 hours, and up to 48. Add additional water if necessary to keep bones submerged. Strain broth into a large bowl through a fine mesh sieve. Discard the solids. Transfer broth into glass jars. Store in the refrigerator for up to one week, or in the freezer for up to 6 months. Leave at least 1” of space at the top of a glass jar if you plan to freeze it. The broth will expand. Click here to get my Homemade Chicken Bone Broth recipe.Click here to get my Vegan Broth Recipe. Finding a healthy chocolate recipe is always on my radar and these Mini Chocolates I created are my new favorite. I’ve tried a bunch of different options and they often come out too grainy. Not these little gems, they are rich while also full of healthy fat and a secret superfood! I think you will be surprised how easy it is to make your own chocolate. Conventional chocolates are made with refined sugar, which has two big negatives connected to it. It causes inflammation in the body…which is what can lead to weight gain. Sugar is made from sugar beets, a GMO product. When you take a few minutes to make your own chocolate you get the relief of knowing exactly what’s in it. Did I mention raw cacao? By using unrefined chocolate, you get the nutritional benefits of chocolate. One of the key nutrients is magnesium, which is considered the “love vitamin” so it’s a perfect time to treat yourself to a little chocolate. I used cute mini muffin liners in the spirit of Valentine’s Day, but you can make it work for any holiday or celebration. If you are serving to kids or anyone with a sensitive palette, you may want to omit the cayenne pepper. Otherwise, cayenne is a warming spice and is great for those chilly months of the year. The secret ingredient in my mini chocolate recipe is Spirulina, a blue-green algae. This offers you a dose of B vitamins, including B12, iron, and antioxidants. You can’t taste it in the chocolates and it’s a great way to add in a superfood. Click here to print your recipe for the Homemade Mini Chocolates and enjoy with someone you love! p.s. Double the recipe…you’ll be glad you did! Those mini chocolates didn’t last long in my house. My homemade granola recipe has been a staple in my home for years. I’ve given it away to teachers, as a hostess gift, and for new mothers. However, it’s time to share how I’ve given my tried and true recipe a face lift. Ever since I worked through the culinary nutrition expert program this fall, my tastes have changed. I eliminated all processed sugar and instead rely on natural sweeteners for the majority of my baking these days. What does this mean? Well, we go through a lot of maple syrup and honey. Real Canadian maple syrup and raw, unpasteurized honey to be exact. These two powerhouse sweeteners do the trick, plus they provide us with some health benefits too. Making my own granola was one of the first ways I started cooking from scratch when I became a parent. As I started reading through cereal labels, I didn’t like what I was reading. My granola was a way to take a break from store-bought cereals and avoid damaged oils (like canola/sunflower/safflower) and also skip the preservatives. What it didn’t do was reduce the amount of sugar to a level I’m now comfortable with. One note about oats. I have learned that oats are often heavily sprayed with pesticides. I look for organic oats whenever possible…even better is when I can find gluten-free, organic oats. (But it’s often quite tough!) You can get it from Amazon currently in the US, here. In the new granola recipe, the flavor is amazing and you can doctor it up to make it your own. Sometimes we eliminate the nuts so I can send it with yogurt as a school lunch. (My kids get so sick of sandwiches.) It’s a healthier version of the original recipe with less sugar, plus Omega 3’s! Both walnuts, and flaxseeds added at the end of the baking, contain Omega 3’s. This mighty essential fatty acid is an antioxidant and an anti-inflammatory. Chronic inflammation is a problem so many people are dealing with and I love adding health-supporting anti-inflammatories whenever possible. Easy Healthy Homemade Granola to give you energy to start your day. Preheat oven to 300°F. Line a large baking sheet with parchment paper. In a large bowl, combine oats, chopped nuts, seeds, coconut, cinnamon, and salt. In a small saucepan, melt honey, maple syrup, coconut oil and molasses. Add melted wet ingredients to the bowl of oats and stir to combine. Pour granola onto the prepared baking sheet. Bake in oven for 45 minutes total, stirring every 15 minutes. Remove from oven and let cool for 5 minutes. Add flax seeds and cranberries, stir to combine. Store in an airtight container once cooled completely. I hope you enjoy the updated version of my healthy, homemade granola. It truly is one of our favorite things to bake as a family and I hope it will become a tradition in your home too. Next up I’ll have to update my post on How to Make Your Own Yogurt. Till then, happy baking!